Karmelle Ltd are a British company specialising in the design, manufacture and installation of bespoke liquid filling machines, capping machines and labellers. With over 30 years of proven experience in the liquid packaging industry, Karmelle offer a wide range of equipment to develop cost effective solutions for our clients’ individual requirements. We are noted for our commitment to providing reliable machinery to meet your industry needs. We serve a variety of industries including food and drink, pharmaceuticals, cosmetics, chemicals, oil and many more. Our team of experts are dedicated to providing you with an unparalleled level of service to bridge the gap between raw product and packaged, market ready product. We are capable of accurately filling and labelling a variety of containers including bottles, bottle in box, jars, vials, canisters, barrels and much more. Over the years we have filled water, juice, oil, peanut butter, yoghurt, e-cigarette liquids, washing up liquids – you get the picture! So drop us an email or give us a call and we can discuss how our machinery can meet the needs of your business. At Karmelle, we understand that each client is different; whether you require a standard machine or a customised packaging system, our process begins with a consultation and a site survey, resulting in machinery tailored to your needs. Machinery is installed by our highly skilled team, and because we manufacture most of the parts ourselves, and are based in Yorkshire, you don’t ever have to go far for spares or servicing in the unlikely case something goes wrong. Since 1985, Karmelle’s machinery has been manufactured in Yorkshire for clients throughout the UK and around the world. In recent years we’ve expanded our products and services to better serve our customers and meet their needs for a complex solution, hence our turn key liquid filling, capping and labelling lines! We have two captains here at Karmelle, and they run a tight ship. Owners, Peter Krawczuk, with a silver tongue and years of experience running his own business and Brian Dickinson, the technical whiz, are a match made in filling heaven! There are two main departments at Karmelle – the Office Trolls and the Manufacturing Wizards. We are a colourful bunch, from design engineers across to the bookkeeping and marketing and sales team, all the way to the machinists, mechanical engineers, labelling and electrical specialists. Not forgetting of course our one and only welder (known as the fire whisperer!). 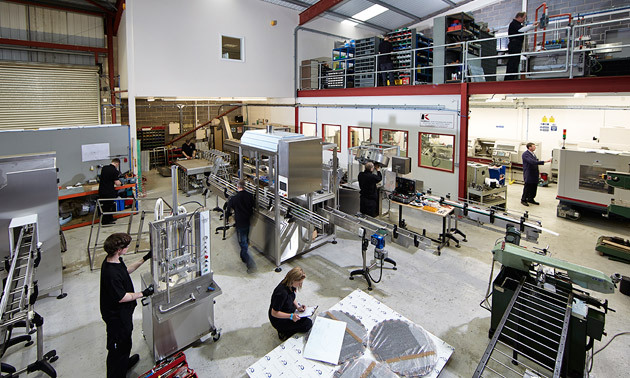 Please feel free to arrange a visit and see for yourself how we manufacture our superb filling machines, labelling machines and cappers. We offer a cuppa and biscuits as standard; we are Yorkshire after all. At Karmelle we aim to offer a complete and bespoke machinery package. That’s why we’ve partnered with a number of selected companies to provide equipment that complements our machinery. Sparc Systems is a global leader in the design and manufacture of Weighing, Inspection, Counting and Bespoke Systems for the food, pharmaceutical and packaging industries. Enercon is the world’s leading manufacturer of induction sealing systems and associated support equipment. IPS specialise in Domino, Hitachi and Video Jet printers. Interactive Coding is a UK company with a global presence. ICE coders are renowned for their ease of use and low cost of ownership. ICE coders provide date, barcode and batch coding solutions for products and packaging, both primary and secondary, across a wide range of manufacturing industries.